Ham, lasagna, chicken broccoli ziti, and cornbread. That was the first helping. Seconds included pulled pork, mashed potatoes, and pineapple stuffing. Yes, pineapple stuffing. Today we came together for the CMB Thanksgiving Luncheon—an annual holiday meal prepared and served by CMB leadership. It's one of our favorite holiday traditions that celebrates community, creativity, and hard work. 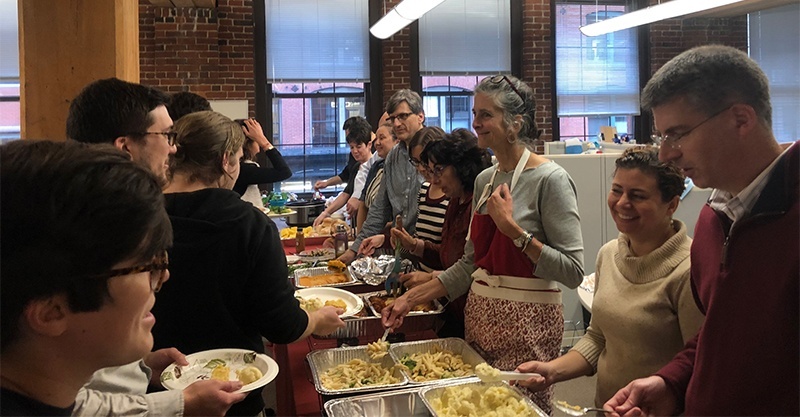 While the holiday luncheon is a chance to sample colleagues' culinary talents, more importantly, it's an opportunity for us to take a break from the busy season and practice gratitude. Thank you to our employees, clients, research partners, and friends who have helped make this an incredibly exciting year at CMB. We wish everyone a happy and safe start to the holiday season.